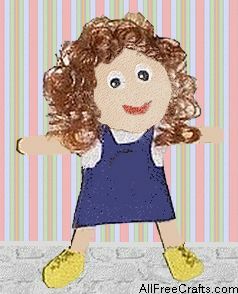 With just three craft sticks, a pompom, some felt, and our free printable clothes pattern, you can make a cute craft stick girl doll. Add a magnet, and you have a locker mascot or fridgie. 1. Glue two craft sticks together at the top, forming an angle so that the doll’s legs spread out at the bottom. Separate the fur of the large pompom until you find a seam. Add a little more glue to the top of the two craft sticks and insert into the separated fur of the pompom. 2. Glue on some doll’s hair, arranging a little on top of the pompom to make a fringe or bangs. Glue on the eyes, the tiny pompom nose, and a small piece of red chenille stem as a mouth. 3. 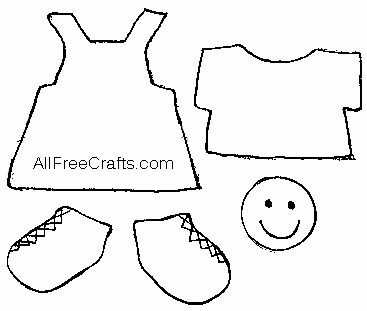 Print the free Stick Doll Clothes Pattern and cut out the pattern pieces. 4. Trace each pattern piece onto felt, in your choice of colors, and cut out. You will need to cut out two shirt pieces and two skirt bib-overalls. You may have to trim or enlarge your pattern pieces. 5. To find out where you should glue on the craft stick for the arms, place one of the shirt pieces over the body, close to the head. The sleeve opening is at the height of the arms. Glue the last craft stick to the body at this height. 6. Now you can glue the clothes onto your doll. Place one shirt piece on the table and position the craft stick body over it with the arms laying across the sleeves. Apply glue all around the edges of the other shirt piece then position it over the first shirt piece, pressing the edges together until the glue holds firmly. Do the same with the skirt overalls. 7. Draw a happy face with permanent marker onto the small felt circle, then glue it in place. 8. Draw some connected X shapes on the shoes, to represent laces, or sew some X shapes with embroidery thread, then glue the shoes to the end of the legs. 9. If you like, glue a refrigerator magnet to the back of the head, or glue a small loop of ribbon to the back of the neck as a hanger.